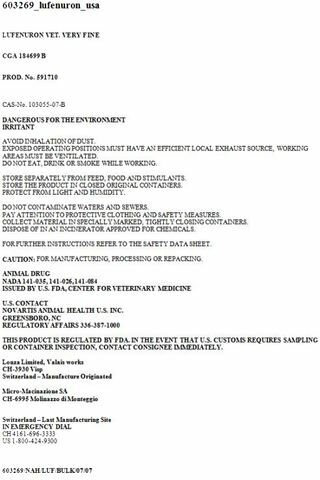 Autor Name: Novartis Animal Health US, Inc. The flavored once-a-month tablet that prevents and controls flea populations in dogs. Novartis Animal Health encourages you to take the time to read this package insert, which describes the use of PROGRAM ® (lufenuron) Flavor Tabs® as a convenient monthly flea control treatment. Controlling flea infestations is very important to the health of your pet. TO ENSURE ADEQUATE ABSORPTION, ALWAYS ADMINISTER PROGRAM FLAVOR TABS TO DOGS IMMEDIATELY AFTER OR IN CONJUNCTION WITH A NORMAL MEAL. Be certain the dog consumes the entire tablet or tablets. As an alternative to direct dosing, tablets may be offered in food. Watch the dog closely following dosing to be sure the entire dose has been consumed. If it is not entirely consumed, redose once with the full recommended dose as soon as possible. Treatment with PROGRAM Flavor Tabs may begin at any time of year. In geographic areas where flea infestations are seasonal, the treatment schedule should begin several weeks prior to the expected onset of infestations. Treatments should continue until the end of "flea season." If there is risk of exposure to fleas year-round, then treatment should continue the entire year without interruption. Ask your veterinarian for details concerning your geographic area and the most effective treatment schedule for your pet. The active ingredient of PROGRAM Flavor Tabs is lufenuron, a benzoylphenyl-urea derivative classified as an insect development inhibitor (IDI). As an insect development inhibitor, PROGRAM Flavor Tabs do not kill adult fleas but effectively and safely control flea populations on your pet by breaking the flea `s life cycle at the egg stage. 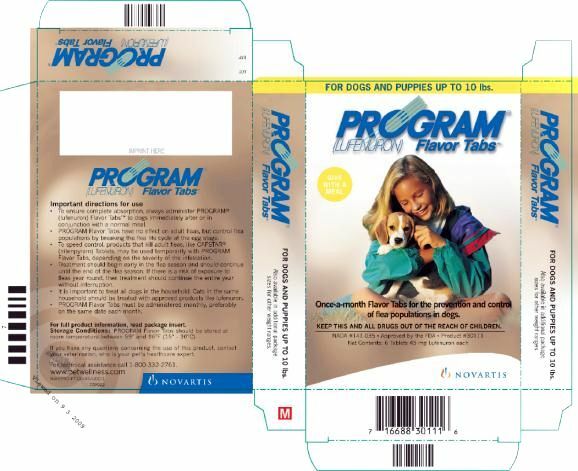 PROGRAM Flavor Tabs are labeled for use in dogs and puppies, four weeks of age and older, for the prevention and control of flea populations. Lufenuron controls flea populations by preventing the development of flea eggs and does not kill adult fleas. You may also need to use a product that kills adult fleas. 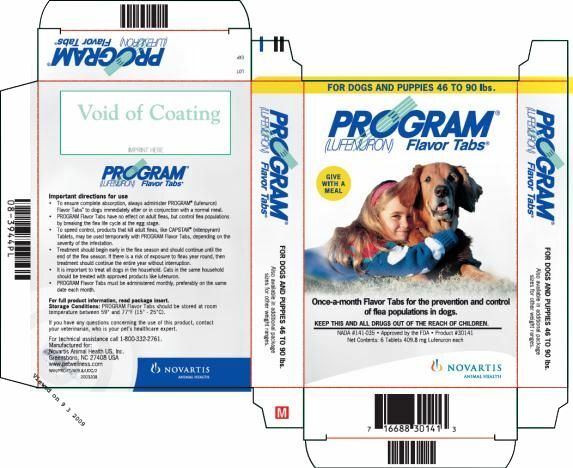 PROGRAM Flavor Tabs may be used along with CAPSTAR ® (nitenpyram) Tablets to provide a Flea Management System that kills adult fleas and prevents flea eggs from hatching. Please see the Supplemental Package Insert provided with this product for information about using the two products together. Without concurrent use of an adulticide, adequate flea control may not be achieved in dogs that have repeated exposure to flea infested animals or environments. PROGRAM Flavor Tabs have no effect on adult fleas but act to immediately break the flea life cycle by preventing eggs from developing into adults. However, pre-existing immature fleas in the dog `s environment may continue to develop and emerge as adults after treatment with PROGRAM Flavor Tabs has begun. Based on results of clinical studies, this emergence generally occurs during the first 30-60 days. Therefore, if you pet already has a flea infestation before starting PROGRAM Flavor Tab s, noticeable results may not be observed until several weeks after dosing. In cooler climates, immature fleas may take longer to complete the life cycle and emerge as adults. To speed control, products that kill adult fleas, like CAPSTAR Tablets may be used temporarily with PROGRAM Flavor Tabs, depending on the severity of the infestation. Your veterinarian can recommend the most effective treatment plan for your pet. To ensure that your pet gets the greatest benefit from PROGRAM Flavor Tabs, you must administer the tablet or tablets once a month in conjunction with a normal meal. If you miss the 30-day interval, give PROGRAM Flavor Tabs immediately and resume your monthly dosing schedule. It is important to treat all dogs in the household. Fleas can reproduce on untreated pets and allow infestations to persist. All cats in the household should be treated with an approved product like lufenuron. The active ingredient in PROGRAM Flavor Tabs is excreted in high concentrations in the milk, however, no resulting adverse effects have been recognized. Although other flea species my be found on dogs, the cat flea ( Ctenoceph a lides felis ) is the predominant flea associated with infestations on dogs in the United States. In addition to the common nuisance irritations associated with infestations, fleas can be responsible for medical problems in your pet such as flea allergy dermatitis (FAD), a skin reaction to flea bites. Fleas also transmit other parasites, including tapeworms. Controlling flea infestations is important to your pet `s health while also reducing the major and minor annoyances associated with these parasites. The following diagram illustrates the flea `s life cycle and where PROGRAM Flavor Tabs acts to break this cycle. Life Cycle of the Flea Fleas can be a problem because they reproduce so rapidly. A single female flea may produce up to 2,000 eggs over her lifetime. Eggs hatch and can develop into adults within only three weeks. Adult female fleas feed by ingesting blood from your dog and subsequently lay eggs that drop off your dog `s coat. Within days, larvae hatch from the eggs and live undetected in your dog`s surroundings, such as the carpet, bedding and other unprotected areas. Flea larvae spin a cocoon, and when appropriately stimulated, a young adult flea emerges and jumps onto your dog to continue the life cycle. After biting a PROGRAM Flavor Tabs treated dog, the female flea ingests lufenuron which is deposited in her eggs. Lufenuron prevents these flea eggs from developing into mature adults. This safe and convenient approach to flea control effectively breaks the flea `s life cycle and controls flea populations. PROGRAM Flavor Tabs are given orally, once a month at the recommended minimum dosage of 4.5 mg lufenuron per pound (10 mg/kg) of body weight. Dogs over 90 lbs. should receive the appropriate combination of tablets. *Please see supplemental insert in this package for concurrent dosing of PROGRAM Flavor Tabs and CAPSTAR Tablets. PROGRAM Flavor Tabs will safely and effectively control flea infestations only if administered in conjunction with a normal meal on a monthly dosing schedule. To help you remember the monthly dosing, use the enclosed reminder stickers on the appropriate dates on your calendar. PROGRAM Flavor Tabs are available in four tablet sizes (see Dosage section), formulated according to the weight of the dog. Each tablet size is available in color-coded packages of six tablets each. PROGRAM Flavor Tabs should be stored at room temperature between 59 ° and 77°F (15-25°C). PROGRAM, CAPSTAR, and Flavor Tabs are registered trademarks of Novartis AG. ©2008 Novartis Animal Health US, Inc. This insert describes the concurrent use of PROGRAM ® (lufenuron) Flavor Tabs® and CAPSTAR® (nitenpyram) Tablets for the management of fleas on dogs and puppies. Please read the insert contained in each package for complete information on the individual products prior to dosing. Give PROGRAM Flavor Tabs once per month to prevent and control flea populations. PROGRAM Flavor Tabs contain lufenuron. Lufenuron controls flea populations by preventing the development of flea eggs and does not kill adult fleas. If a dog currently has a flea infestation, more rapid relief can be accomplished by adding CAPSTAR Tablets to the treatment as follows. Administer CAPSTAR Tablets once per week until adult fleas are no longer observed. For a severe flea infestation, administer CAPSTAR Tablets twice per week until adult fleas are no longer observed. Additional CAPSTAR Tablets may be administered as needed to kill the occasional adult flea picked up from infested environments. It is important to treat all cats (see reverse side of this insert) and dogs in the household. Fleas can reproduce on untreated pets and allow infestations to persist. ** Dogs over 90 lbs. are provided the appropriate combination of PROGRAM Flavor Tabs. The following adverse reactions have been reported in dogs after giving PROGRAM Flavor Tabs: vomiting, depression/lethargy, pruritus (itch, scratchy skin), urticaria (wheals, hives), diarrhea, anorexia (loss of appetite), and skin congestion (red skin). In addition to the common nuisance irritations associated with infestations, fleas can be responsible for skin conditions in the dog such as flea allergy dermatitis. Fleas also transmit other parasites, including tapeworms. The control of flea infestations is important to the pet `s health and reduces the problems associated with these parasites. 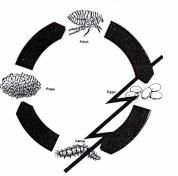 Life Cycle of the Flea A single female flea may produce up to 2,000 eggs over her lifetime. Eggs hatch and can develop into adults within only three weeks. Adult female fleas feed by ingesting blood from the pet and subsequently lay eggs, which drop off the pet `s coat. Within days, larvae hatch from the eggs and live undetected in the pet`s surroundings, such as the carpet and bedding. Flea larvae spin a cocoon, and when, appropriately stimulated, a young adult flea emerges and jumps onto the pet to continue the life cycle. 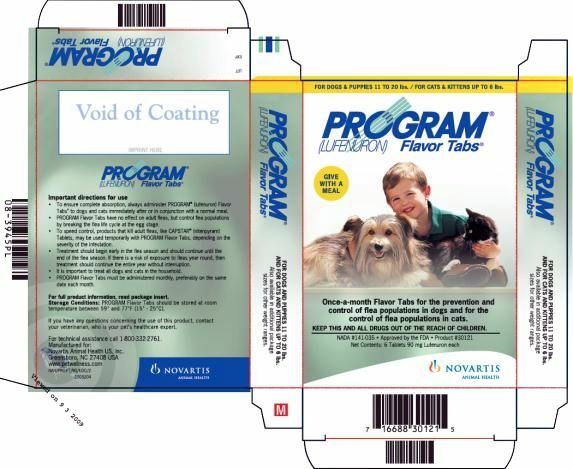 After reading this insert, if you have any questions about the concurrent use of PROGRAM Flavor Tabs and CAPSTAR Tablets in your dogs, please call Novartis Animal Health Veterinary Product Support at 1-800-332-2761. Store PROGRAM Flavor Tabs and CAPSTAR Tablets as described on the individual product inserts. The once-a-month flavored tablet that controls flea populations on cats. 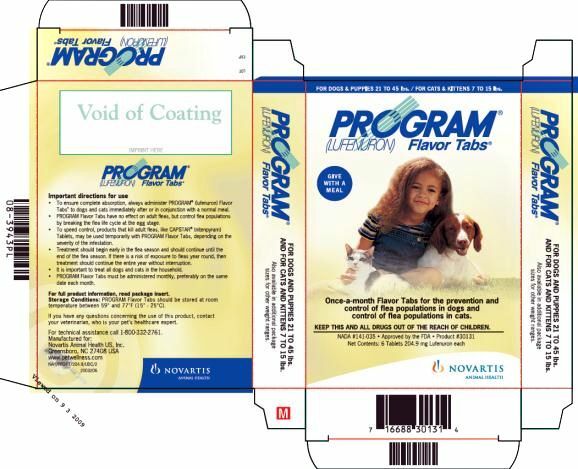 Novartis Animal Health encourages you to take the time to read this package insert which describes the use of PROGRAM ® (lufenuron) Flavor Tabs® as a convenient monthly flea control treatment. Controlling flea infestations is very important to the health of your cat. After reading this insert, if you have any questions about PROGRAM Flavor Tabs, flea control, or medical problems associated with flea infestations, consult your veterinarian, who is your pet`s health care expert. Be certain the cat consumes the entire tablet or tablets. The tablets can be broken prior to direct dosing for ease of administration to small cats and kittens. As an alternative to direct dosing, tablets can be broken and mixed into wet food. In multiple cat households, each cat should be treated separately to achieve adequate dosing. Watch the cat closely following dosing to be sure the entire dose has been consumed. If it is not entirely consumed, redose once with the full recommended dose as soon as possible. Treatment with PROGRAM Flavor Tabs may begin at any time of year. Treatment should continue until the end of "flea season." If there is risk of exposure to fleas year-round, then treatment should continue the entire year without interruption. Ask your veterinarian for details concerning your geographic area and the most effective treatment schedule for your cat. PROGRAM Flavor Tabs are available in two sizes of tablets for oral administration to cats and kittens according to their weight (see Dosage section). The active ingredient of PROGRAM Flavor Tabs is lufenuron, a benzoylphenyl-urea derivative classified as an insect development inhibitor (IDI). As an insect development inhibitor, PROGRAM Flavor Tabs do not kill adult fleas, but effectively and safely control flea populations on your cat by breaking the flea `s life cycle at the egg stage. PROGRAM Flavor Tabs are indicated for use in cats and kittens, four weeks of age and older, for the control of flea populations. Without concurrent use of an adulticide, adequate flea control may not be achieved in cats that have repeated exposure to flea infested animals or environments. PROGRAM Flavor Tabs have no effect on adult fleas, but act to immediately break the flea life cycle by preventing eggs from developing into adults. However, pre-existing immature fleas in the cat `s environment my continue to develop and emerge as adults after treatment with PROGRAM Flavor Tabs has begun. Based on results of clinical studies, this emergence generally occurs during the first 30-60 days. Therefore, if your pet already has a flea infestation before starting PROGRAM Flavor Tab s, noticeable results may not be observed until several weeks after dosing. In cooler climates, immature fleas may take longer to complete the life cycle and emerge as adults. To ensure that your pet gets the greatest benefit from PROGRAM Flavor Tabs, you must administer the tablet or tablets once a month in conjunction with a normal meal. If you miss the 30-day interval, administer PROGRAM Flavor Tabs immediately and resume your monthly dosing schedule. It is important to treat all cats in the household. Fleas can reproduce on untreated pets and allow infestations to persist. All dogs in the household should be treated with an approved product like lufenuron. Although other flea species my be found on cats, the cat flea ( Ctenoceph a lides felis ) is the predominant flea associated with infestations on cats in the United States. In addition to the common nuisance irritations associated with infestations, fleas can be responsible for medical problems in your pet such as miliary dermatitis, a skin reaction to flea bites. Fleas also transmit other parasites, including tapeworms. Controlling flea infestations is important to your cat `s health while also reducing the major and minor annoyances associated with these parasites. Life Cycle of the Flea Fleas can be a problem because they reproduce so rapidly. A single female flea may produce up to 2,000 eggs over her lifetime. Eggs hatch and can develop into adults within only three weeks. Adult female fleas feed by ingesting blood from your cat and subsequently lay eggs that drop off your cat `s coat. Within days, larvae hatch from the eggs and live undetected in your cat`s surroundings, such as the carpet, bedding and other unprotected areas. Flea larvae spin a cocoon, and when appropriately stimulated, a young adult flea emerges and jumps onto your cat to continue the life cycle. A fter biting a PROGRAM Flavor Tabs treated cat, the female flea ingests lufenuron which is deposited in her eggs. Lufenuron prevents these eggs from hatching and developing into mature adults. This safe and convenient approach to flea control effectively breaks the flea`s life cycle and controls fl ea populations. PROGRAM Flavor Tabs are given orally, once a month, at the recommended minimum dosage of 13.6 mg lufenuron per pound (30 mg/kg) of body weight. Cats over 15 lbs. are provided the appropriate combination of tablets. *Please see the supplemental insert in this package for concurrent dosing of PROGRAM Flavor Tabs and CAPSTAR Tablets. PROGRAM Flavor Tabs will safely and effectively control flea infestations only if administered on a monthly dosing schedule. To help you remember the monthly dosing, use the enclosed reminder stickers on the appropriate dates on your calendar. The following adverse reactions have been reported in cats after giving PROGRAM Flavor Tabs: vomiting, depression/lethargy, anorexia (loss of appetite), diarrhea, hyperactivity, dyspnea (labored breathing), pruritus (itchy skin) and skin eruptions (rash). PROGRAM Flavor Tabs are available in two tablet sizes (see Dosage section), formulated according to the weight of the cat. Each tablet size is available in color-coded packages of six tablets each. This insert describes the concurrent use of PROGRAM ® (lufenuron) Flavor Tabs® and CAPSTAR® (nitenpyram) Tablets for the management of fleas on cats and kittens. Please read the insert contained in each package for complete information on the individual products prior to dosing. In cats and kittens the concurrent use of PROGRAM Flavor Tabs and CAPSTAR Tablets is indicated to kill adult fleas and prevent eggs from hatching. The effects of PROGRAM Flavor Tabs, which control flea populations, and CAPSTAR Tablets, which treat flea infestations, are combined to provide a FLEA MANAGEMENT SYSTEM. Give PROGRAM Flavor Tabs once per month to control flea populations. PROGRAM Flavor Tabs contain lufenuron. Lufenuron controls flea populations by preventing the development of flea eggs and does not kill adult fleas. If a cat currently has a flea infestation, more rapid relief can be accomplished by adding CAPSTAR Tablets to the treatment as follows. Administer CAPSTAR Tablets once per week until adult fleas are no longer observed. For a severe flea infestation, administer CAPSTAR Tablets twice per week until adult fleas are no longer observed. Additional CAPSTAR Tablets may be administered as needed to kill the occasional adult flea picked up from infested environments. It is important to treat all dogs (see reverse side of this insert) and cats in the household. Fleas can reproduce on untreated pets and allow infestations to persist. The combination of PROGRAM Flavor Tabs and CAPSTAR Tablets should be administered according to the following schedule. Weigh the cat prior to administration to ensure proper dosage. Do not administer to cats under 2 pounds. ** Cats over 15 lbs. are provided the appropriate combination of PROGRAM Flavor Tabs. The following adverse reactions have been reported in cats after giving PROGRAM Flavor Tabs: vomiting, depression/lethargy, anorexia (loss of appetite), diarrhea, hyperactivity, dyspnea (labored breathing), pruritus (itch y skin), and skin eruptions (rash). The safety of the concurrent use of PROGRAM Flavor Tabs and CAPSTAR Tablets has not been evaluated in kittens less than 7 months of age. In addition to the common nuisance irritations associated with infestations, fleas can be responsible for skin conditions in the cat such as miliary dermatitis. Fleas also transmit other parasites, including tapeworms. The control of flea infestations is important to the pet `s health and reduces the problems associated with these parasites. PROGRAM Flavor Tabs break the flea life cycle by inhibiting egg development. CAPSTAR Tablets rapidly kill adult fleas on the cat. The concurrent use of these two products provides an effective flea management system. Life Cycle of the Flea A single female flea may produce up to 2,000 eggs over her lifetime. Eggs hatch and can develop into adults within only three weeks. Adult female fleas feed by ingesting blood form the pet and subsequently lay eggs, which drop off the pet `s coat. Within days, larvae hatch from the eggs and live undetected in the pet`s surroundings, such as the carpet and bedding. Flea larvae spin a cocoon, and, when appropriately stimulated, a young adult flea emerges and jumps onto the pet to continue the life cycle. After reading this insert, if you have any questions about the concurrent use of PROGRAM Flavor Tabs and CAPSTAR Tablets in your cats, please call Novartis Animal Health Veterinary Product Support at 1-800-332-2761. FOR DOGS AND PUPPIES UP TO 10 lbs. Once-a-month Flavor Tabs for the prevention and control of flea populations in dogs. and for the control of flea populations in cats. FOR DOGS AND PUPPIES 21 TO 45 lbs. / FOR CATS & KITTENS 7 TO 15 lbs. and control of flea populations in cats. FOR DOGS AND PUPPIES 46 TO 90 lbs.